It’s not very often that you get to teach UFC champion fighters how to surf. Today Shannon and I coached Rich Walsh and Kyle Noke 2 of Australia’s best UFC fighters! Not only are these two of Australia’s toughest athletes but also champion blokes. On our way down to the beach both the guys had to stop to talk to the camera, shake hands and kiss some babies.. the life of being a some of Australia’s best UFC fighters. Shannon and I gave them a quick surf pep talk and then we hit the water, in the first set both the boys caught waves and rode them like pros! Their surfing talent came to no surprise to Shannon and I as they are very fit and strong professional athletes! The lesson seemed more like a fun surf session with mates. The UFC boys were catching their own waves and paddling out wanting more. By the end of the lesson they were both feeling the surfers stoke and Rich said that surfing was one of the best things he had done (hopefully he takes it up as a hobby). 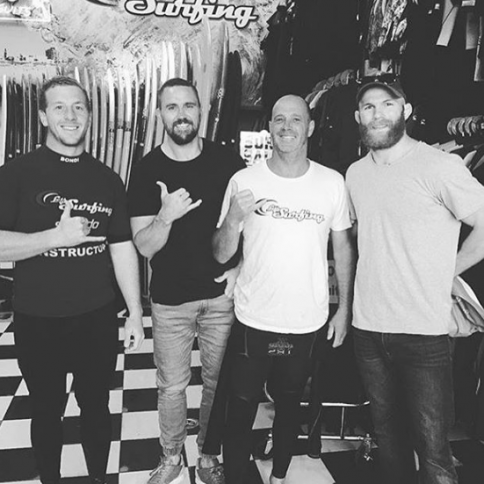 It was awesome to have Rich Walsh and Kyle Noke come down and surf with us. We wish them all the best in their upcoming fights and hope to see them out in the water again soon. Want to try out a lesson like the boys? Check out whats on offer.